And now we bring you the LOTION STICK. A solid moisturizer in a tube that you can apply where you need it and whenever you need it. NO MESS, NO FUSS, EASY AND CLEAN AND A LITTLE GOES A LONG WAY. The ultimate convenience in a moisturizer! 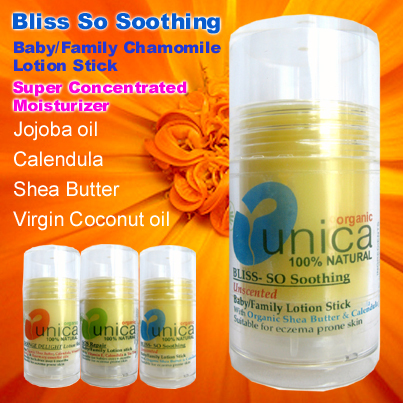 Bliss Organic cream stick is the most gentle and soothing solid lotion for you & your baby. From hair to toes, it can be applied anywhere and whenever you need it. It makes also a wonderful lip balm and I personally use it on my hands and body when my skin needs extra protection. A wonderful soothing solid lotion for the whole family. The gentle blend of pure organic oils and butters, natural Vitamin E and the soothing healing properties of Calendula and German Chamomile make this balm ideal for very sensitive and eczema-prone skin. BABY - apply sparingly to freshly washed and dried skin. Re-apply as often as necessary at nappy change. For sanitary reasons, use one stick per baby. REST OF THE FAMILY - Great for sore and dry areas and where your skin needs extra protection. Remember, a little goes a long, long way! "A baby is God's opinion that the woulrd should go on"
WHAT IS A LOTION STICK? Our solid lotions do not contain water, that’s why they will last longer than a much larger bottle of regular lotion. 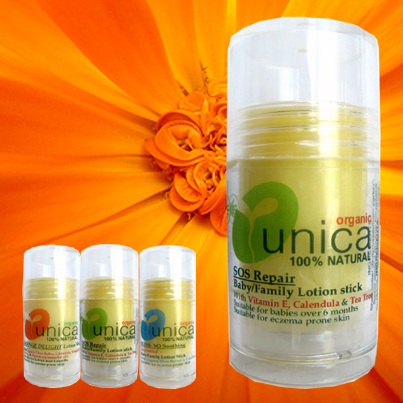 A lotion stick is an intensive care, a super concentrated solid lotion, in a push/twist-up applicator tube. It is like lip balm, but can be used on the skin all over your body! It will quickly soften and soothe even the roughest, driest, chapped or cracked skin. The warmth of your skin allows solid lotion to glide right onto your skin. You don't even need to rub it in! If when applying it seems too oily or greasy, it just means that you are applying too much. Great for cuticles, knees, elbows, and feet, lips also work as a Hair Finishing Balm! Great for outdoor lovers, frequent flyers who spend long hours in airplane cabins that dry out your skin, in the gym, on your desk, in your bag, on the go…the list is endless. So handy and convenient and, above all, NO MORE MESS! Lotion Sticks are a great way to apply lotion to your feet without getting lotion all over your hands! Ladies: lotion sticks are great for moisturizing skin after shaving legs!! Lotion Stick makes a perfect gift! Men and children love the lotion stick. My little boy cannot wait to get out of the bath to use his ‘magic stick’! For best shelf life store in cool dark place. Do not leave lotion stick in a hot vehicle, in direct sunlight, or in any other hot place. Excess heat can soften or melt the lotion stick, possibly causing leakage or damage to the product or damage to items near the product..
Shea butter has antiinflammatory properties and it is used to treat stretch marks, smaller wounds, dry skin and skin infections such as eczema. It has excellent softening properties, protects the skin against dehydration, and has a Sun Protection of 2-3. Contains Phytosterols, which stimulates the formation and growth of new cells. Calendula is one of the best known and versatile healing herbs, widely used by herbalists throughout the centuries. Used for its healing and tissue regenerating properties for all skin types and conditions, including sensitive skin. Calendula has antiseptic, antifungal and antibacterial properties, and it is used to treat sores, sunburn as well as red itchy and inflamed skin.